It was June, and the kids had finally gotten out of school. So we loaded them into the Wagon Queen Family Truckster and headed north for Seattle and then the Canadian Rockies. A month earlier, my wife had the great idea of ordering Mariners tickets before we left. And so I called the box office–that’s what we did back then…call the box office–looking for four seats for the day game on June 27, 1999. It seemed to be a challenge to find four seats together, even though the Mariners were playing their usual .500 ball. Finally, the ticket agent found some and mailed them to us–yes, mailed. When we arrived at the game about half an hour early, we were shocked to discover a half mile long line to get into the park. 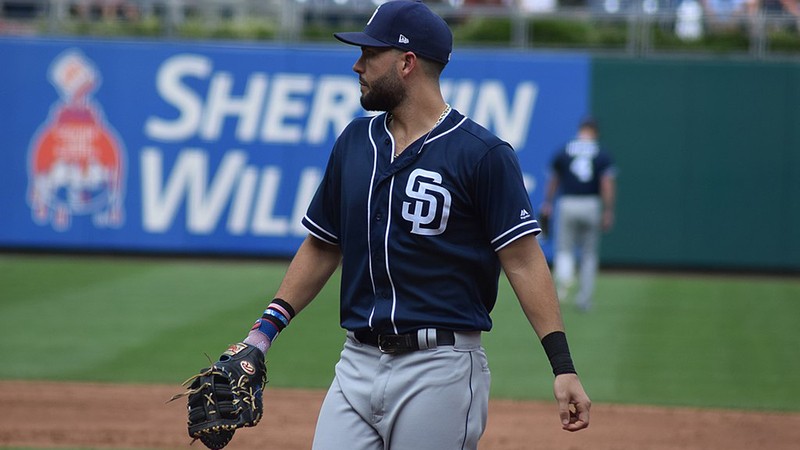 “The Kid” made the game memorable with a three-run shot in the bottom of the first and the thrilling theft of a homer later in the game that the Mariners won, 5-2. In March 2000, the Kingdom was imploded. Most ballparks are very different from regular buildings when it comes to the forces the ground exerts on them. The weight of the building is supported by and uniformly distributed to internal posts; the ground provides upward forces on these posts to keep the building from collapsing. A ballpark typically has a strong external post as well as a few internal posts strategically positioned so they don’t block the view in the seating areas. In the sketch below, the heavy black post is the main external post; you can see other internal posts as well. The decks are cantilevered out from these posts. In case you’ve never thought about it, this sketch shows why the higher decks must get increasingly steep so fans can see the entire field. Notice the red lines along each deck more or less intersect at the edge of the field. 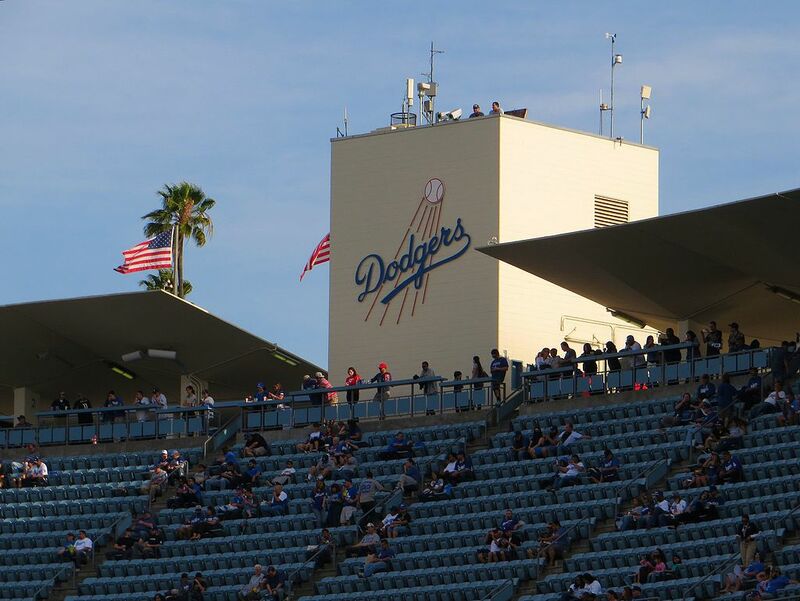 This effect is very noticeable in places like Dodger Stadium, which has five decks. The staff on the top deck are called ushers, but they really a bit more like Sherpas. Back to the structure of ballparks. The detailed sketch above is not that different from the tree that grows between my yard and my neighbor’s. He loves the sun, so he constantly lops of the limbs that grow on his side. I prefer the shade, so over the years the tree has taken on the dangerous contour shown below. All of the weight of the tree is on my side in the same way the weight of the stadium is on the field side. To keep this tree from toppling over, the ground has to be pulling downward on my neighbor’s side of the tree and pushing upward on my side. This is all well and good unless a strong rain precedes a wild wind storm. The trunk of this tree and the external post of the ballpark are very similar in this regard. The outside edge of the post must be pulled downward, while the inside edge must be pushed upward. Recall, regular buildings only feel upward forces from the ground. So to bring down the tree, one just needs to eliminate the upward force the ground is exerting on my neighbor’s side. A chainsaw or axe taken to the bottom of my neighbor’s side of the tree will do nicely. To bring down the ballpark, an explosion on the outside bottom of the external post will do the trick. Of course, a little help–like destroying the internal posts–couldn’t hurt. Above, a typical building is dropped in place by blowing up the internal posts. You can hear these explosions, but can’t see them because they are inside. Once the posts are destroyed, the building just collapsed directly on itself. Riverfront Stadium in Cincinnati was one of those many multi-purpose stadiums thought to be pretty clever in the 1970s. I guess they were on to something, since The Big Red Machine dominated the National League for a decade once Riverfront became their home. The Reds continued to use it for three more decades until it was replaced by the Great American Ballpark in 2003. The implosion starts with explosions to destroy some of the internal posts along the left field line. They are shortly followed by blasts near the bottom of the first three external posts. The stands then start to collapse and pull down the rest of the park as the destruction works its way around the field. The Kingdome’s demolition was a bit different from Riverfront’s because of the roof. 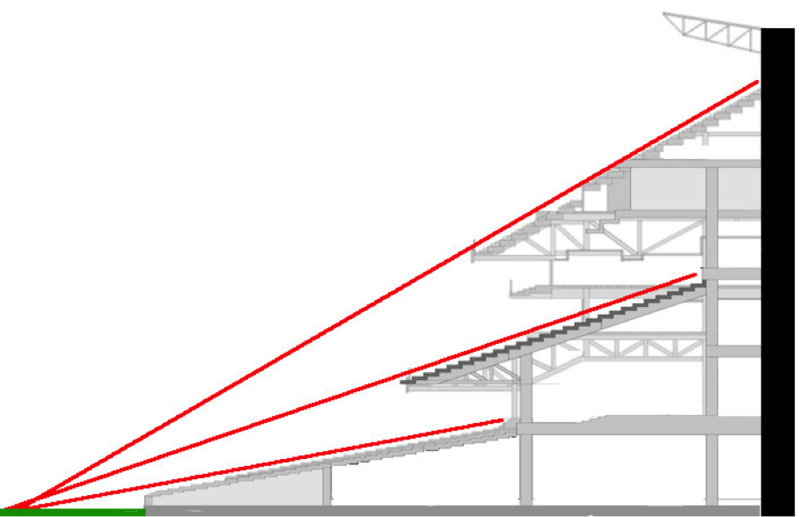 The roof actually prevents the stands from falling inward very easily. As such, the downward force exerted by the ground on the outside of the external post was much smaller or even non-existent. 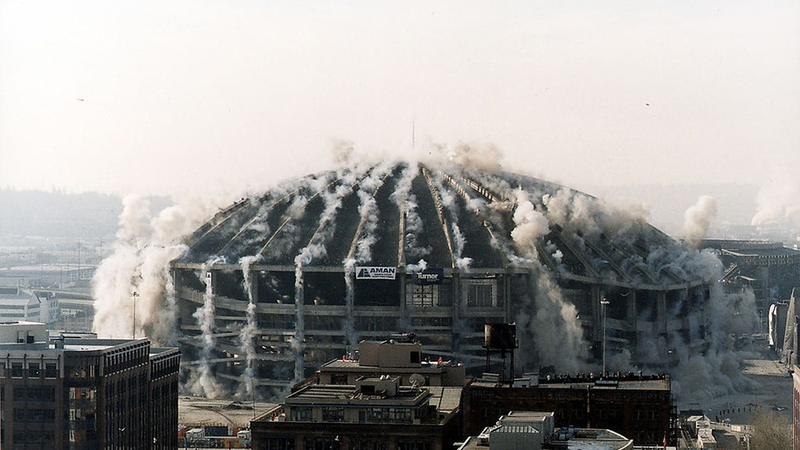 The Kingdome needed to be imploded much more like a regular building than a stadium like Riverfront did. The implosion began with the destruction of the roof beams, followed quickly by the explosions destroying the external posts. The result was the stands and the roof falling more or less straight downward instead of folding into the field as at Riverfront. Some were yearning to see Turner Field in Atlanta implode, just as the Braves tended to do in the latter years of their tenure there. However, it seems the park will be converted into a football stadium for Georgia State University. Oh, well. Perhaps MLB finally will do something about the mess that is the ballpark in Oakland. Then we might get to see another stadium demolition. I wonder if the lines for the last game played at the Colosseum will rival those my family and I saw all those years ago in Seattle. The demolition of Three Rivers Stadium was one of the most notable events in this category. Six world championship clubs in both baseball and football played there, and roughly a dozen Hall of Famers called TRS home. Legendary superstar Roberto Clemente’s 3,000th hit, the Immaculate Reception, and the great 1976 Pitt football team beating Penn State enroute to a convincing National Title were a few of the magic moments at that facility. Baseball, explosions, implosions. Does a Wednesday morning get any better than this? I love to watch Baseball.